Cinnamon, may help people with diabetes have better blood sugar control, (about 1/2 teaspoon per day which is quite a bit, try it stirred into hot breakfast cereal perhaps), however for people with a tendency to have migraines it may be a cause or become a cause if eaten regularly. Migraines can become more sensitized to things after long term use or certain chemicals can be triggers possibly due to overactivity of TRP ion channels. In the last post I mentioned that wearing blue light blocking glasses in the evening for any screen time. It has been found helpful to prevent sleep difficulties to wear them during the three hours prior to trying to go to sleep. 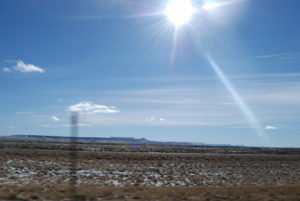 The blue light blocking glasses are not needed for use throughout the day however. Eyestrain from a long day working with a light screen may cause dry itchy eyes and eyedrops for moisture and taking occasional breaks may help prevent that problem. Read more: (4). 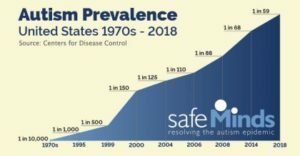 Throughout the history of science discoveries there have been many researchers who try things for themselves or discover things because of their own health issues or a patient with a unique problem. Migraines are very painful and medication can be expensive and may lead to rebound headaches when used too often – if migraines last three days and you have one twice a week than how helpful can four migraine pills a month be? Proper references for citing other’s work is important and the gel pack idea is one I tried based on the biothermal device idea. A different research team found a cooling plastic cap helpful for insomnia, which also sounds like it is based on some sort of cooling electric blanket effect. (gizmodo) Pain hurts and insomnia can increase risks for hypertension, diabetes, epileptic seizures, and also migraines. Cinnamon, tasty, but not for me, it causes migraines for me. Read labels if you suspect it might be a migraine trigger, it may be added to herbal tea in addition to baked goods or breakfast cereals. Food triggers for migraines generally cause symptoms for me the next day or within 8-12 hours or so. Chemical irritants such as ozone, formaldehyde, or pollutants in cigarette smoke that are inhaled may cause migraines sooner, within a few hours or less sometimes for me. Additional information here: Tips for Avoiding Migraine Triggers, WebMD, getting adequate sleep is one of the tips. Regarding TRPA1 channels and trigeminal pain sensing neurons – lots more to read later: trigeminal pain sensing neurons TRPA1 channels Substance P .
Around 1999 to 2000 there was a sharp increase in the rate of autism diagnosed. Changes in awareness and/or diagnosis criteria may have some impact on short term changes but the increase in rate from the 1970s is significant. 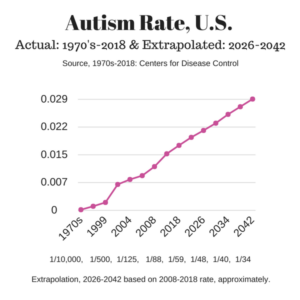 Extrapolating into the future following the recent rate of change in the rate of children diagnosed with autism takes us to an estimated rate of 1 in 34 children in the year 2042. 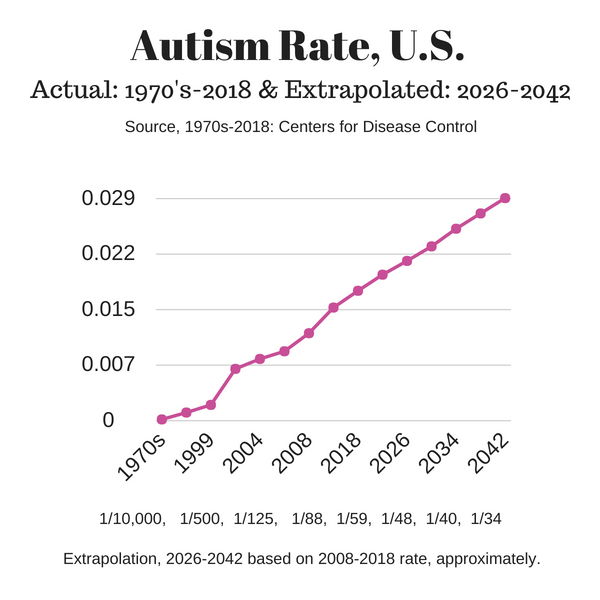 We all need to ask ourselves if now is a better time to try to prevent autism from occurring in our nation’s children or if we should wait until 2042. There are multiple risk factors including specific timing during the infant’s prenatal development, exposure to certain toxins, and nutrient deficiency and/or genetic susceptibility – complex, yes, but complex just takes a little more work to handle. Improved screening for risk factors of mothers during perinatal and prenatal care and screening of infants and toddlers before symptoms occur could help provide individualized guidance to help reduce known risk factors associated with increased risk of developing autism. Step 1: Believing is the First Step Towards Change. Step 2: Self Care for Prenatal Health, Part One. Step 2: Part Two, Self Care for Prenatal Health. Step 2: Self care prenatally: Why? What about everybody else? Step 3: Let’s Protect Against All Disease During Infancy. (Biomarkers are ways to tell that the baby’s body chemistry, lab tests, are different than typical using the umbilical cord blood sample that is already being collected and used for other screening purposes – it would just add expense, so first set of five simplest tests would be done on all infant’s samples and those who had the differences noted in children who later in life developed autism, would be screened for the second set of five and those who continued to have the noted differences in lab values would have the third set of five lab tests performed on the cord blood sample; the series of testing provides increased accuracy of results while saving some time and money on the number of biomarkers involved. It is a complex problem, requiring complex strategies. 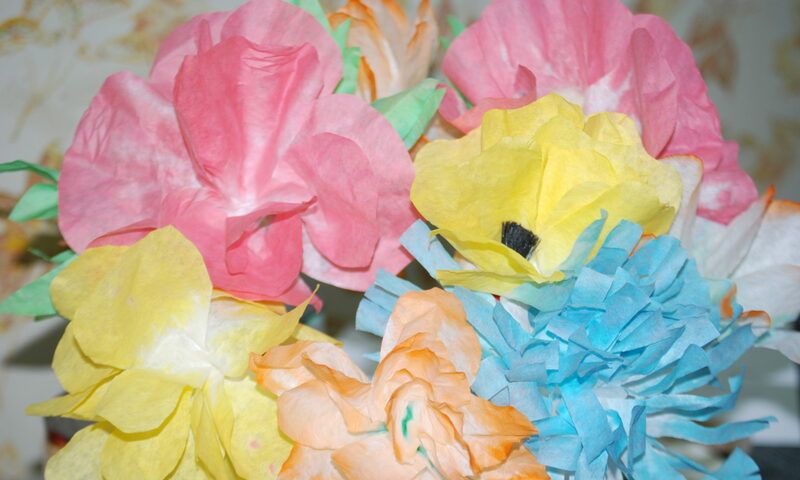 The infants who tested with the differences could then have nutrient deficiency and genetic screening tests done for the known risk factors and social and lifestyle factors could be evaluated in the home (things like vinyl flooring and poor air circulation, especially if there is a smoker in the house or large numbers of decorative candles). More about formaldehyde, it may be a risk factor for many types of chronic illness across the lifespan. It is a toxin found in vinyl flooring and second hand smoke: Formaldehyde: Health Risk and Environmental and Dietary Sources.